The original and oldest part of the cemetery consisted of the northeast area of the grounds. The earliest known burial in the cemetery was in November of 1834 when Rachel Henry was interred here. Local history tells us that the Baptist Church of Westfield started in 1835 and, indeed, land and historical records show that a portion of the oldest part of the cemetery was once property of the Baptist Church of Westfield. From the above-described church property, only a small piece on the east side, measuring two rods east-west and eight rods north-south, would not eventually become cemetery land. The Baptist Church sect in Westfield was gone by 1858 but, at least for a time, this cemetery may well have been closely tied to the Baptist Church. That aside, it quickly overtook the east cemetery as the village’s primary burial place. It is not clear when ownership of the Baptist Church property reverted elsewhere but we find that by 1873 it is owned by Levi D. Allis. The original cemetery was just over an acre. It was laid out in five rows of lots – a total of 61 individual lots – each containing eight gravesites. Lots measure 20 feet long and 20 feet wide. Each lot covers two rows of graves; meaning that instead of each gravesite within the lot laid one right next to the other (as in single row lots), four are found in one row and the other four are found immediately behind them in the next row. Each row of lots is separated by a lane. One of these would eventually become the East Drive. The lots were numbered starting in the southeast corner with Lot 1 and moving west. Once reaching the west edge the numbering moves to the next line of lots to the north and proceeds back eastward. This same east-west alternating pattern continues throughout the remainder of this area of the cemetery as you move northward to the road. The west property line of the cemetery, at that time, ran just to the east of the center driveway. Gravesites are numbered as shown in the diagram below. The top of the diagram is north. 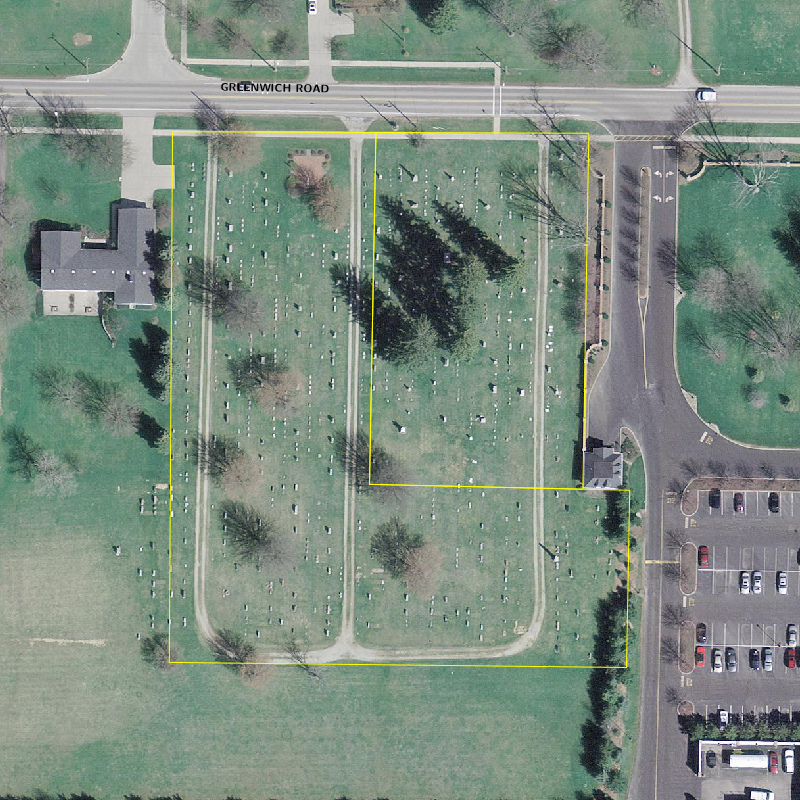 This system is used for almost the entire cemetery, regardless of the number of gravesites in the lot. “…commencing at a point on the south line of the East & West road running through the center of said township, twenty-seven (27) rods west of the northeast corner of said lot number twenty-one (21) running thence west on the south line of said East & West road, four chains and seventy-five links to the northeast corner of land belonging to J.E. Shaw; thence south six chains & eight and three-fourths links; thence east five chains & twenty-four links; thence north two chains & four & one-half links; thence west fifty links to A.J. Wright’s west line; thence north on said Wright’s west line four chains to the place of beginning containing two & eight hundred & eighty-one one thousandths (2 881/1000) acres. 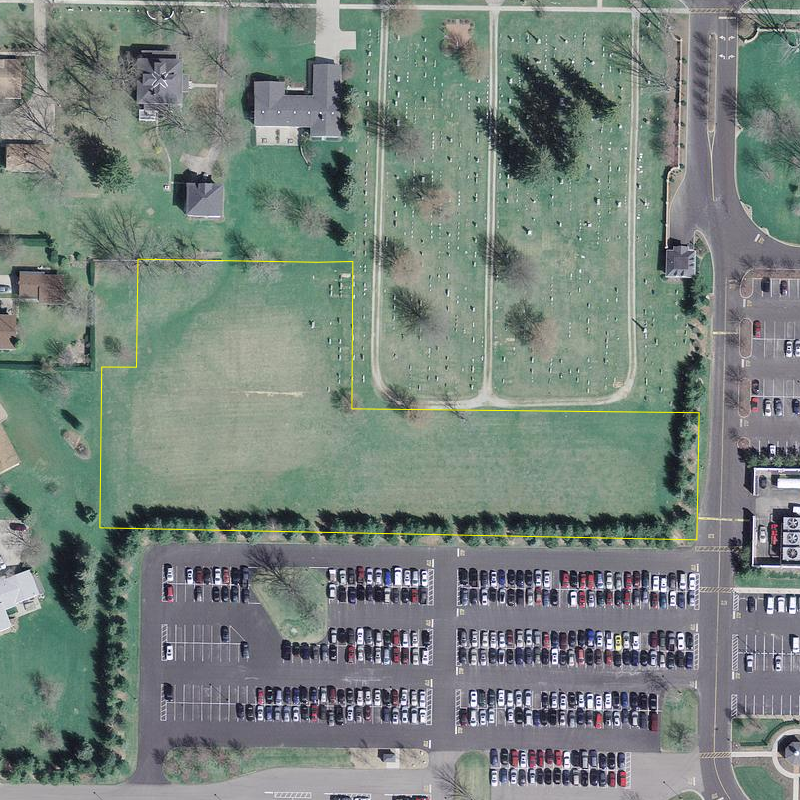 This purchase consists of the remainder of the cemetery except for the open area south of the rear driveway and the newer section on the west side. When these lots were numbered, the same pattern was used as was found in the original cemetery except that it was done in reverse. Numbering begins in the northwest corner and proceeds east until reaching the original cemetery boundary. From there the numbering continues with the next row south and moves back to the west until it reaches the property line. This continues as you move south throughout the remainder of this addition. Lot numbering here begins again with Lot 1 but all of these lots have the letter “A” added to them to differentiate from the original cemetery lots. Lot size is the same as in the first purchase with the exception of lots 74-A through 95-A. Those lots measure 20 feet by 12 feet and village records show as setup for eight gravesites (six is more likely). Lots 151-A, 152-A (west), and 158-A are also smaller; measuring 20 feet by 10 feet and are each set up for four gravesites. All lots are double-row lots as in the original cemetery. Lanes are also found between each row of lots. Two of these would become the Center and West drives. These, along with the East Drive, extend south from the road and connect to the rear driveway. The driveways are each about nine feet wide. The other lanes between the rows are each about eight feet wide. The WPA map, drawn up before 1940, shows that lots 152-A through 158-A did not exist yet at that time. The first burial in those lots looks to be that of Andrew Tesler in 1975. The addition of those seven lots is important because there are two lots that bear the number 152-A in the cemetery. The first was on the southwest corner of the cemetery near the turn in the driveway. The WPA map shows this lot numbered as such; as well as a map in township records that was drawn up when lots for the new section on that side were laid out. When lots 152-A through 158-A were added to the east side, the original lot 152-A was likely forgotten and the northernmost lot of this addition was given that number as well. The current village records pretty much ignore the original lot 152-A as it was never sold, has no known burials, and does not even appear on the most recent village map of the cemetery. It is included in our records in the interest of completeness. It is also worth noting the reinterments that have been made in this cemetery from other burial locations. The Wolcott and Chamberlain families are both known to have moved those buried in their private family cemeteries here to the village cemetery. Others were undoubtedly moved from the Old Leroy cemetery on the east side of the village. Some of these reinterments are conspicuous by the dates of the deceased and older style headstones – when found in a section of the cemetery that wasn’t even added until 1894. While there are a few in that area that predate the purchase by only a few years; there are others which are much earlier. The Farnum monument and burials in Lot 52-A are a perfect example of this – perhaps moved from Old Leroy near the family homestead. The Booth children mentioned on a headstone in Lot 3-A are another. Thence, South 89-degrees 36-minutes 28-seconds East, along Swarts’ southerly line and the southerly line of a parcel of land now or formerly in the name of Eugene N. and Lucille M. Clark (D.V. 480, Page 292), a distance of 221.83-feet to the place of beginning. The remainder of the new purchase has, as of yet, not been platted out for cemetery use. Despite being located within and cared for by the village of Westfield Center, the entire cemetery – except the newest acquisition – was still legally owned by the trustees of Westfield Township. This detail was rectified in September of 2008 when the property was transferred to the village. The burial listings for this cemetery were compiled from a cemetery map in the care of the village of Westfield Center and supplemented with tombstone inscriptions, death records, and obituaries in old newspapers. This map provides burial locations, lot ownership, and layout information although it provides no dates. Given the incompleteness of the WPA map, and to avoid any confusion, all of the listings here will follow the individual grave designations found in the current cemetery records. The burial listings have been formatted in such a way so as to show each lot in its entirety. The half of the lot with odd numbered gravesites will be listed, followed by the even numbered gravesites for that lot. It is important to keep in mind the layout of the graves as one interprets the information in these listings. This information can be found at the beginning of each section’s listings. Village cemetery records viewed were current through the spring of 2006; although some information obtained afterwards has been included.